Chinese tourists on the beach at Phi Phi island, Thailand, the setting for the Leonardo de Caprio movie The Beach, about an isolated, virtually unknown tropical paradise. The New York Times’ Thomas Friedman has been saying this for years, but it took me moving to Indo-china to witness it firsthand. Tucked as I am between India and China, which contain most of the world’s population, I shouldn’t be surprised to eventually notice my gargantuan neighbors. But something big has happened in just the time I have been here. The Chinese middle class has become affluent enough to travel. And now they are everywhere. The Chinese especially love Thailand, because here anything goes. It is to them a wide-open, highly affordable,and exotic place. It’s their Mexico. The low-budget Chinese comedy “Lost in Thailand”, sort of an Asian “Hangover”’ prompts hoards of young people to revisit the locations shown in the movie. Many of them are in Chiang Mai, where I live, in the North. In the last two weeks, during Chinese New Year, when we had 200,000 Chinese tourists visit our city of half that size, young couples with two-thousand-dollar cameras wandered in a daze, taking pictures of each other, of anything and nothing at all. They’re simulating the act of taking pictures the way five-year olds pretend to drive a toy car. They do everything in clumps. They are not used to being alone or unsupervised, and they don’t know what to do with that freedom. Currently, I am in Southern Thailand, on the beach, two hours south of Hua Hin, and the Chinese are here, too. These are not the young hipsters, but rather the middle class who have just gotten rich enough to join tour groups. They travel in clumps of three and four giant busses, partying on the beach, singing karaoke, and taking selfies with their cellphones. As a rule, this class doesn’t have SLR cameras yet. They are an older crowd. The probably remember how to ride bicycles. You young hipsters who come to Chiang Mai don’t know, because China forsook the bicycle twenty years ago. They certainly don’t seem to chafe under the restrictions on individual freedoms, in fact they seem happy to have their activities programmed. Last night I came across a beach party for a large group of Thal young people, maybe office workers. They were probably on a team-building business excursion. They too were lined up sitting in the sand in neat rows, with supervisors speaking to them over megaphones. They seemed to be having a good time. Who am I to criticize? This is the part of the world that revels in copyright infringement, that apes every western trend, where the movie theaters are full of our most infantile cinematic product. Fast and Furious 7 is coming to theaters soon, and you can be it will be quite a hit. But when will Asia come into its own? When will a few rebellious Thai or Burmese boys start a band that changes world music, or invent a computer in their garage that sets the word on fire? One thing we have to remember is that English is the dominant language for tourism and business, and that the Chinese are rapidly learning to speak it. Thais have so far done a marvelous job of refusing to do so. Aided by a feudal government school system, they are quickly being sidelines. And then there is the question of the military dictatorship, martial law, lese majeste laws that prohibit any free dialogue about the current state of affairs. So don’t look to Thailand as the sparkplug for Asian progress. Thais are no enraptured by the Chinese visitors. In general, Chinese speak loudly, crudely, spit on the ground, don’t flush toilets, and put less value on politeness than do Thais. 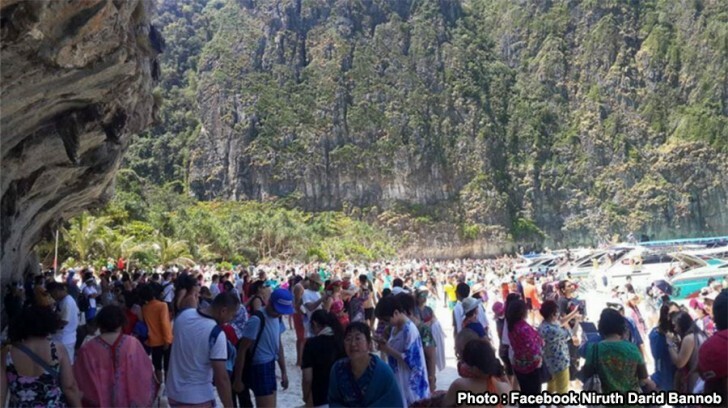 But Thailand is grateful for the income Chinese tourism brings. Without it, the drop in Western tourism brought about by the coupe and subsequent crackdowns on free speech would have been far more painful. Yes, the Chinese are coming and there are a lot more of them on the way. Their migration around the world as tourists and then investors will change every country that welcomes them. When I lived in San Francisco, North Beach went from being an Italian neighborhood to an extension of Chinatown, thanks to the first wave of those fleeing Hong Kong before it was turned over the mainland China. Housing prices spiked all up and down the West Coast. When I was in Argentina most of the all-you-can eat restaurants, grocery stores, and variety stores were owned by the Chinese. Here in Thailand, I pay a $35 tourist visa fee to enter the country. The Chinese pay nothing. I once visited a super luxury resort near Chiang Mai. The staff took one look at my clothing and decided they would tolerate my presence but not encourage it. I was surrounded by rich Chinese hipsters playing with their I-pads as they nursed expensive drinks. I asked for a brochure. The staff informed me they were all out.